The tea light in this box has been individually crafted in a small workshop in the Scottish Borders, using local beeswax. Beeswax burns longer and cleaner than almost any other wax. Whilst not artificially scented they do have a wonderful honey smell that comes from the honey the wax contains. Beeswax candles release negative ions, which will clean allergens and dust from your home. Take the time to appreciate the gorgeous glow it gives to wherever you choose light it. 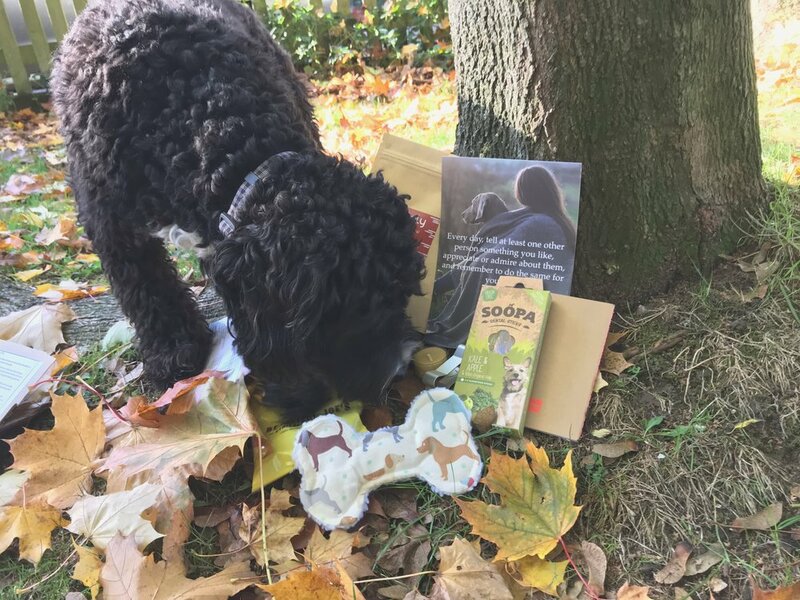 The Beautiful Joe treat bag is one of our all time favourite things – this bag contains dried liver treats for your companion, while either out on a walk, as a training aid or just because you love them so much. The reason they are a Hygge favourite is that for every bag that is purchased Beautiful Joe donates exactly the same to a rescue, helping our beautiful beasts who have yet to find their forever human companion. Embodying the Autumn season there is the gorgeous fragrant and delicious Hoogly Baked Apple Chai. It’s perfect either in a flask while you are out with your four-legged friend(s) or while sat watching the evenings close in and the skyline colours change. Take in the beauty that is this time of year. Since after a treat we are able to brush our teeth, unfortunately dogs can’t do the same, and while some dogs are very good at allowing their humans to do it for them, our hygge hounds are not quite as accommodating. So we have included our lovely Soopa 100% plant based dental sticks, which help maintain good dental hygiene. The small toy is fun that your much beloved will enjoy as you throw it for them to decide, whether to go get, go get it but not actually let you have it back, or the dream response, go get bring back then let go so we can throw it again! Last and absolutely most importantly – your Hygge card. We often don’t appreciate ourselves, those around us or what and who we are, so these season take the time if only for 30 seconds once or twice a day, whether you are out with your beloved canine, a friend, on your own with a tea light in the bath, or even having some you time in the gym - think of the delightful things that have happened that day, and write them down in the notebook included in this season’s box. Take your time. It doesn’t need to be an essay – as simple as “ the sky as I drove to work” “the joy of the dog as I came through the door” the smell of freshly made cookies” or as detailed as you like. Then as the season moves on, try and go back through the entries to remember these marvellous feelings and cherish them.